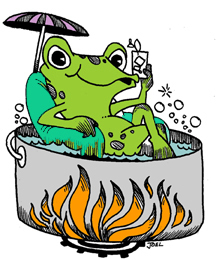 Put a frog into a pot of tepid water and then place the pot on the stove, the frog will begin to slowly cook and not even realize it. Because the water heats gradually. He doesn’t even notice the water is starting to get hot. It is like he has become a part of his environment and didn’t notice the change in temperature. So is it with us…. one compromise at a time, one stretched truth at a time, the next thing you know, you are so far from the truth, you are in boiling water. I suppose the moral of this story is to look around you, have you become a part of your environment? Have your senses grown dull? Has your love grown cold? Are the lies and excuses flowing right off your tongue and you don’t even feel the conviction anymore? Are you feeling comfortable and like the idea no one challenges you? Or do you find yourself constantly looking over your shoulder? Oh, my friend, the water is boiling… get out of the pot.